The fastest-growing refugee disaster in the world is unfolding along the Myanmar-Bangladesh border in South Asia. As of this week, more than 400,000 people have escaped intense violence in Rakhine State, where the Burmese military is carrying out “clearance operations” purportedly targeting insurgents, but that the UN High Commissioner for Human Rights recently described as a “textbook example of ethnic cleansing.” The spiraling political crisis and humanitarian catastrophe have severe and unique consequences for women, who make up a substantial portion of the displaced population. The Rohingya refugee crisis is a complex situation driven by a variety of factors related to ethnic and religious cleavages as well as competition over natural resources. A Muslim minority group in an overwhelmingly Buddhist-majority country, the Rohingya have faced violent persecution and systematic ostracization for decades. Denied citizenship, the Rohingya have virtually no political voice. Widespread human rights abuses have characterized the most recent wave of violence, which began this summer after a small rebel group attacked local authorities. Civilians have borne the brunt of the military’s retributory attacks, which include scorched earth tactics, massacres, torture, forced disappearances, landmine blasts, and sexual violence. Although the Burmese military denies such allegations, women have reportedly been the targets of opportunistic and orchestrated rapes by security forces in the region. More than 40 percent of villages previously occupied by the Rohingya have emptied in recent weeks as people have fled on foot and in boats across the Naf River to Chittagong, Bangladesh. Bangladesh lacks the wealth and infrastructure necessary to deal with a disaster of the scale it now confronts: it is an overpopulated and underdeveloped country that is prone to natural disasters and rising sea levels. Nevertheless, Bangladeshis have largely united in support of the Rohingya refugees. In a rare show of agreement, opposition parties backed Prime Minister Sheikh Hasina’s decision to shelter the Rohingya fleeing violence, at least for the time being. After visiting refugees in camps near the border, she urged Myanmar’s government to accept Rohingyas back and guarantee their security, but also spoke of a responsibility to care for the huddled masses she encountered. The government of Bangladesh has announced that it will build additional temporary shelters to cope with the influx of refugees who are currently living in squalor a bazaar that was previously a tourist destination and beach town. The humanitarian task before local authorities, however, is colossal, and without an end in sight. Relief organizations have reported acute hygiene and sanitation problems in temporary camps that disproportionately affect women and girls. Without access to electricity, clean water and latrines, women must resort to walking into jungles in the dark, leaving them susceptible to harassment, violence, and contracting gastrointestinal diseases. Scores of mothers with newborns and pregnant women have also arrived seeking medical care and protection. Reproductive health care and access to family planning and feminine hygiene products is particularly important for women and their families during disaster, but such needs typically go unmet during humanitarian emergencies. Many of the refugees are also in shock due to the brutality they endured and witnessed in their homeland, but have limited access to psychosocial resources. Lessons learned in Syria and elsewhere remind us that women and girls who are forcibly displaced are typically traumatized and at fresh risk of abuse while living in precarious conditions. Moreover, Unicef claims that 60 percent of refugees that have arrived in Bangladesh thus far are children, meaning that hundreds of thousands of Rohingya youth are out of school and girls are left especially vulnerable to sexual exploitation and trafficking. Even before the recent spate of violence, Rohingya women’s rights were being trampled upon by the state. 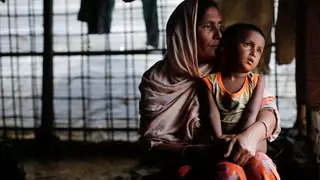 Unable to vote, own property, or choose the number of children to have, and at risk of arbitrary detention and violence at the hands of security forces, Rohingya women have survived on the margins of society for generations. But their situation became progressively worse in the recent years: one of the starkest examples of this was a controversial 2015 law restricting interfaith marriage that disproportionately disenfranchised women and ethnic minorities. The escalating humanitarian crisis only compounds these existing inequalities. As the humanitarian emergency continues to unfold, the UN, EU, international aid organizations, and governments across the globe are trying provide assistance to alleviate refugees’ suffering—such efforts must take into account the specific risks faced by women and girls. In the immediate crisis, this means implementing gender-sensitive refugee processing mechanisms to collect data on women and girls entering camps, deploying trained female interpreters and health workers, and protecting female refugees from additional violence—including by ensuring access to sanitation facilities, offering gender-segregated spaces, and providing families with lockable shelter. Earlier this month, the government of Canada took a positive step in this direction, pledging $2.5 million in assistance for Rohingya women and children as part of its new foreign aid budget, which was expanded to support global efforts related to family planning, prevention of sexually transmitted diseases, gender-based violence, and maternal and neonatal care. Still, the gap between resources available and resources needed remains vast worldwide, and particularly so in the rapidly evolving Rohingya disaster. It is critically important that additional humanitarian action is coordinated in accordance with the UN Security Council Resolution 1325, and takes into consideration the rights and roles of women and girls.